the living spaces radiate well-being emphasised by the elegance of the materials. comes in a two or three cabin version. Air Step® 2 marks considerable development in this technology and it is now compatible with IPS engines. 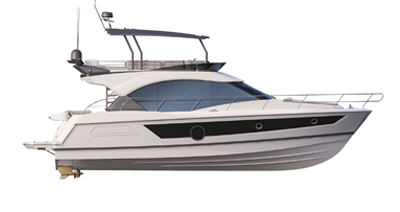 By increasing the volume of air inflow under the hull threefold, the boat benefits from higher performance, safety and seakeeping. While reducing fuel consumption, she accelerates faster and gains speed. This latest generation of the patent has already proved its worth offering excellent sea-keeping, simpler passage through the waves, linear acceleration and easily handling of curves. The ‘air cushion’ effect aft of the hull procures amazing comfort. Designed for loads of 350 kg, the large swim platform is submersible and can easily take the weight of a Jet Ski or dinghy. There is a storage locker in which all your swimming and water sport accessories can be kept close at hand. 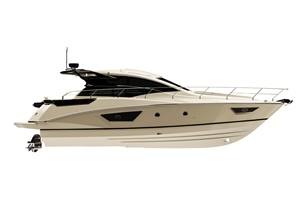 Bathed in natural light, the galley in the Gran Turismo 46 is designed in an L shape. It is very well equipped with a double Kenyon ceramic hob, a fridge-freezer and lots of storage places. For even greater comfort, it can be fitted with a microwave and dishwasher. In the two-cabin version, the galley faces a convivial lounge, ideal for chatting while cooking meals. CE Certification B12 - C12. Aft bench seat to convert into two electrically operated sun loungers. Large storage locker accessed by the swim platform (fenders, mooring lines, dinghy, Stand up paddle, etc.). Volvo IPS 600 or Z-Drive engine delivering up to 2 x 400 HP, both compatible with Air Step®2 technology. Submersible swim platform where a dinghy or jet-ski can be stored. Designed to take a 350 kg load. Large forward sun lounger (4 m²) with lifting backrest. Hardtop opening completely, electric side glazing. Huge "full beam" owner cabin and guest cabin with V-berths, double sea view and ensuite bathroom. Guest cabin with bunk beds. Fitted galley, 230 L refrigerator/freezer and lots of storage. On option, oven/grill and vitroceramic hob. Lots of storage in the cabins (hanging lockers). Panoramic porthole is for a sea view on all sides. Huge "full beam" owner cabin and guest cabin with V-berths, sea view on either side and ensuite bathroom. Interior U-shaped lounge with 26" TV facing the galley, seating 6 people.